Pre-order status of Google Glass Explorer Edition violates eBay policy. A Google Glass eBay listing put a dollar amount on the hype that the search engine giant's wearable, non-emasculating tech is generating: USD $15,900 (around £10,468, AUD$15,500). That's 10 times the amount Google will charge for the developer version of its hands-free video, photo, and directions-capable AR head-mounted display. 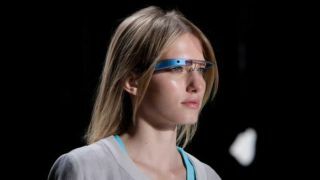 The reason this eBay auction skyrocketed is because the official Google Glass release date is still "sometime in 2013." The new Google Glass YouTube video of the specs being used in real-life situations probably didn't hurt the eBay auction's dollar amount either. eBay has since pulled the instantly popular Google Glass auction, citing its ban on users selling goods that haven't been released yet. "This item was removed as it was in violation of our presale listings policy," an eBay spokesperson told TechRadar. Sure enough, seller "bla7kcat" didn't appear to have the Explorer Edition of Google Glass in-hand (or on-face) just yet. "I've been selected as an early adapter [sic] for Google's upcoming release. You are buying a brand new unopened pair of Google's Project Glass glasses," read the non-spell checked listing, according to The Guardian. "I will be personally attending and picking up my pair in either Los Angeles, or New York at Google's Project Glass launch event, which will take place some time [sic] after Feburary [sic] 27th." Whether or not yanking the auction was urged by Google remains a mystery, as the Mountain View, California company would only say that "we don't have a comment to share." However, Google seems to have an interest in keeping Google Glass leak-proof. Earlier this month, the company demoed Google Glass at a conference that reportedly included strict NDAs. Seller bla7kcat didn't get back to TechRadar on whether or not he or she will relist the Google Glass eBay auction once the wearable unopened head-mounted display is in hand. Of course, with early adopters willing to pay $15,900 for tech that won't be available to everyone until 2014, there's a good chance that bla7kcat or a copy-bla7kcat will be looking to profit from Google's innovation the first chance they get.